The U.S. Mint’s latest sales report has been released, giving us our first look at sales figures for the 2016 American Eagle Platinum Proof Coin, the Nancy Reagan First Spouse Gold issues, and Ronald Reagan $1 Coin products. 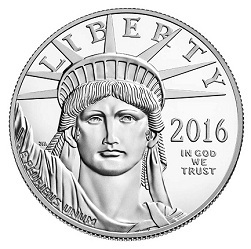 Last week’s most anticipated release was clearly the 2016 American Eagle One-Ounce Platinum Proof Coin, which sold out its entire mintage in just 56 minutes last Thursday. The current sales total for the coin is 9,810 units; this is 190 pieces shy of its 10,000-piece maximum, but it is unclear whether the Mint will sell any more of these coins following the handful of returns and cancellations that are bound to occur. A thorough assessment of the aftermarket potential for this item can be found here. The 2016 Nancy Reagan First Spouse Gold Proof and Uncirculated Coins debuted a day later, respectively posting 1,428 and 792 sales during their first few days of availability. These numbers are marginally higher than those realized by the Patricia Nixon and Betty Ford First Spouse gold coins in the days following their releases, and are comparable to figures posted by the Lady Bird Johnson issues released last August. Rolls, bags, and boxes of Ronald Reagan Presidential $1 coins opened strong as well, giving the Mint its two top-selling items for the week. 25-coin rolls of Philadelphia- and Denver-minted Reagan dollars sold 27,264 and 26,312 units, respectively, slightly less than first-week sales for the Johnson, Nixon, and Ford dollars, but higher than totals realized by the Kennedy issues from last June. The release of the Reagan Presidential and First Spouse coins marks the conclusion of both the Presidential dollars and First Spouse gold coins series. Rounding out the top five bestselling products for the week were the 2016 U.S. Mint Proof Set, which took fourth place with 7,649 units sold, and the 2016 U.S. Mint Silver Proof Set Set, which came in fifth with 4,812 sales. Mintage limits for many of the products on the following report can be viewed on the Coin Update Mintage Limit Chart. The full weekly sales report is included below. The following statistics show total sales for the listed items through July 4, 2016. The first numerical column includes information from the Mint’s June 26 report, the second column displays this week’s updated numbers, and the third column tallies the increase in sales over the last week. Items new to the report are listed in bold. For more information on any of these products, please visit the U.S. Mint’s online product catalog.